Before hiking, cycling and alpinism, and before she became a ‘mountain fairy,’ Uta Ibrahimi spent 12 years in marketing. Probably because of the 33-year-old’s personality, the strength and will to do things well and a character that holds nothing back, she was a director of management in one of Kosovo’s top marketing companies. Then suddenly six years ago, while on a trip with “Uncle Bashkim,” she discovered the joy of the outdoors and of being at one with nature. After that she got in contact with hiking groups, and started going twice a month, then four times a month, and then she would not come back home for two to three weeks, tripping with her bike in all the regional mountains. Two years ago she left her marketing job for good, and her life took a turn for the less beaten track. After a while she created her own company, organizing hiking trips in regional areas, and becoming one of the few Albanian women that does this for living, and mountains have become her life and love. The list of mountains that Ibrahimi has scaled — that she has ‘been there and done that — reads like an encyclopedia entry for Europe’s most iconic peaks: France’s highest peak, Mont Blanc (4,880 m), where she was the first Albanian woman to reach the summit; Musala (2,925 m) in Bulgaria; the ‘home of the Greek Gods,’ Mount Olympus (2,918 m), a solo winter expedition to Slovenia’s highest peak, Triglav (2,863 m); and Turkey’s Mount Erciyes (3,200 m), Mount Hasan (3,200 m) and Emler (3,700 m). She’s also climbed many of the big mountains closer to home; Jezerce (2,694 m) and Korabi (2,764 m) in Albania and Titov Vrv (2,754 m) in Macedonia — ascents of Gjeravica (2,656 m), have been so frequent for her that it’s like going to the swimming pool for most people. 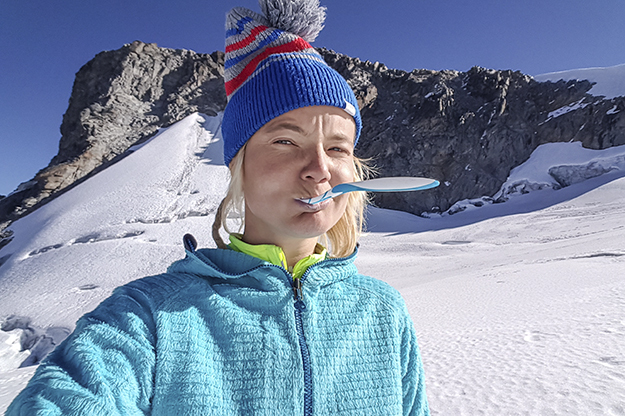 Over the past six years Uta Ibrahimi has scaled some of Europe’s most iconic peaks. Photo courtesy of Uta Ibrahimi. In December Ibrahimi left Europe’s ranges behind and set out to challenge herself in the mighty Himalayas, the range which is spread over five countries (Bhutan, India, Nepal, China, and Pakistan) and that boasts some of the world’s highest peaks, including the world’s highest — Mount Everest (8,848 m). During a four week trip to Nepal, as part of the Albanian Women in the Himalayas project organized by Albania’s Dajti Alpine Tourist Fellowship, Ibrahimi and her Nepalese guide Tendi Sherpa negotiated summits far higher than those she is used to: Yalung Peak (5,700 m), Nurbu Peak (5,800 m) and Ramdung Peak (5,925 m). 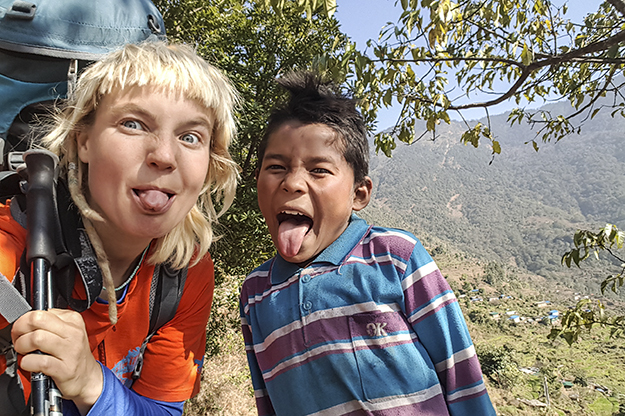 The aim of this trip was to improve her mountain fitness and to help acclimatize to the altitude and conditions; in future phases of the project — which will last for a year and a half — she will return to the Himalayas to scale even more peaks. The climate in the Himalayas ranges from tropical at the base of the mountains to permanent ice and snow at the peaks, getting progressively colder as the altitude rises. During her trip, there were times when the temperature plummeted to minus 15 degrees Celsius. Over the course of the three weeks of hiking, Ibrahimi was awestruck by what she experienced around her, noting that everything had a “different color.” She believes that her trip was also a spiritual journey; a woman in nature feeling tiny whereas nature is endless — a setting to make one humble and wise. 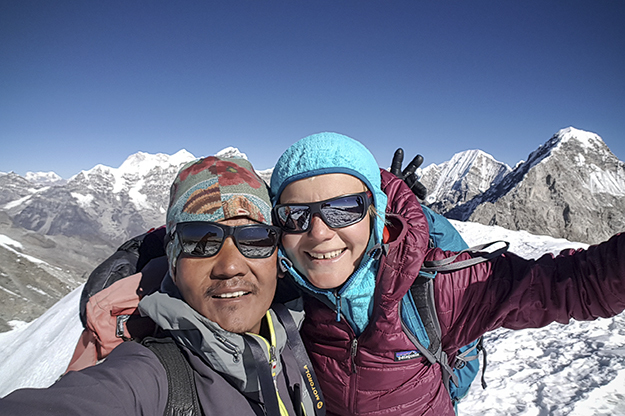 Uta Ibrahimi — pictured here with her Himalayan guide Tendi Sherpa — scaled peaks approaching 6,000 above sea level on her recent trip to Nepal. Photo courtesy of Uta Ibrahimi. Uta Ibrahimi: Sometimes I feel bad because I broke my principles… I ate some [meat] in the Himalayas. K2.0: Which food was most prevalent there? One of their specialties: Dal-bhat. Dal bhat is a big rice plate. Dal is their word for lentil, and bhat for rice. There was also another plate. The rice was on the main plate, and fried potatoes with curry and some other things — herbs and stuff they took from nature. Then they’d take this lentil plate and add rice to it, then we’d mix it by hand, and eat it. This was their specialty. It’s what they eat daily. And there was no meat in it? It depends. There was a village 2,800 meters above sea level that served meat in their Dal-bhat. Up until that village, they ate meat. But villages there were spread up to 4,200 meters above sea level. That’s the highest that people lived. From 2,800 meters upwards, all villages were vegetarian. Vegetarian because of their beliefs? Not because they didn’t want to eat meat. They just didn’t have any. Their life depended on their location. There were seven villages that didn’t even have electricity. They didn’t even have proper paved roads. Were the bags you were carrying heavy? My bag was about 15-16 kg. But besides the guide, we also had porters; young men that are paid to carry things around. They are with you the whole time? Up until a point. They were with us until we reached 5,000 meters above sea level, then we went on by ourselves. We made it to other camps. One at 5,300 meters and one at 5,700 meters above sea level. At these two points we were alone, because they went back down. How did the hiking work practically, day to day? Throughout the whole time we stopped in villages along the way. We would walk, then when we’d reach another 2,000 meters, we’d sleep in the nearest village. The last village we stayed in was Na. We stayed there for four days. That was our 4,200 meter base. We did rock climbing training there. One day for example we climbed 4,900 meters then came back down and slept in the village. The next day we went to another peak. We did ice climbing. We used ropes and other equipment. We had a base, as you would normally — a camp or a house. 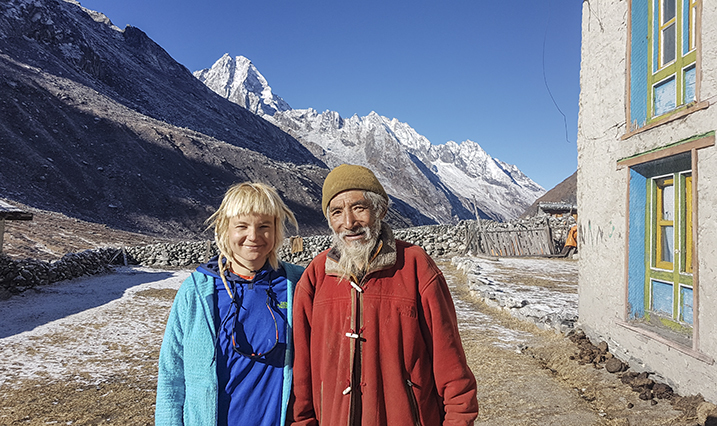 The last village Ibrahimi stayed in on her three week trek was Na, where she met a local man who had climbed Mount Everest on 12 occasions. Photo courtesy of Uta Ibrahimi. What about the effects of the altitude? Was trekking at these altitudes tiring? The idea of climbing is that you can often walk up 2,000 meters — climb from 4,000 to 6,000 meters above sea level. You can do that when you are physically fit. But it is very problematic because when you come back down you have headaches, fever… because our bodies are adapted to different things. When we get above 3,000 meters we start to notice it, because our bodies tell us that something is different — not wrong, just different. So you need to give your body time to adapt to that new altitude. That’s why we [first] stayed for a couple of nights at 4,200 meters above sea level. And another two or three nights at 5,000 meters. 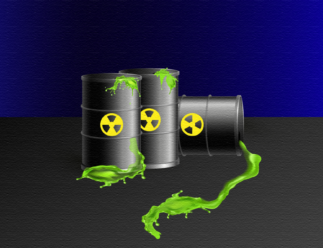 Can you explain a little more about how the process of adapting to that environment works. I stayed in the mountains at about 6,000 meters above sea level, and I’m going there again to do a couple more 6,000s, 6,500s and a few others. I’ll be there for three months, and I’ll do some more training. Taking people’s phones away for three hours is enough to stress them out. Imagine being away from everyone for three weeks. I wanted to know beforehand how my body would feel at that altitude. Because you can’t go 7,000 meters without trying 6,000 meters first. It’s not just the way your body reacts to that altitude. Was three weeks a bit too much? No, but on the third day when we reached one of the villages, I started to worry about staying there for three weeks. Not that I was physically tired — I was pretty well-prepared in that sense — but because I missed my daily routine, my friends and family, and I was alone with my guide… the two porters were always further back and did not communicate much with us, as they did not speak English. I’d meet locals in the villages, but I still missed my friends and family. They were very nice. They’d greet you by saying “Namaste” [A common respectful greeting in Nepal and India which roughly translates as “bowing to you”]. They’d give you love, but there was not much to speak about with them, as they did not speak English. 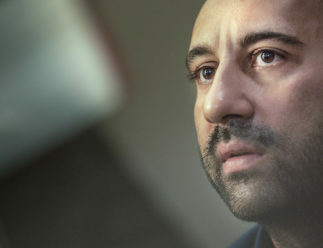 After initially missing friends and family at home, Ibrahimi says she quickly adapted to her surroundings. Photo courtesy of Uta Ibrahimi. But after the first couple of days, things started to change. I didn’t think about home anymore, nor my routine, or anything else. I adapted and the fact that I hadn’t showered for quite a while didn’t bother me anymore. Not having wet wipes didn’t bother me either. We went without showering or washing our faces for three weeks. We would only wash our faces with snow from time to time. What were the conditions like? The weather, the terrain, etc. It was really cold. For two nights there was a lot of wind in the camp. It was quite scary, because we were camping at 5,700 meters above sea level on glaciers. And really close to us on the glaciers were two crevices, one below us and one above us. And I was thinking about how, if the wind blows just enough, it could blow us right into those crevices. They were huge, deep holes that went down into the glaciers. This was also a part of my training, understanding how to read the terrain. With snow that has fallen recently, it is more dangerous because you cannot see these crevices. But when we went it wasn’t snowing so it wasn’t too dangerous. Usually, in such places, in the Himalayas but also in Europe as well, there are glaciers, so you need two people to be tied to one another with ropes, so if one falls, the other can save them. Yes. The Rolwaling Valley was one of the places where, in the 17th century, Buddhism really developed greatly. It was sort of like a secret place. There were a few villages in this valley. One village had three houses and a temple. Temples were usually situated very high up in hills. Everything I saw was millions of times greater than me and my strengths and flaws. It was spiritually calming and cleansing. There was a certain energy, especially at that village. As much as I like it, I also wanted to escape it. They spoke about the Yeti; they believed there was a big, white man. They weren’t sure about whether it was a man or not. They had never seen it, but they had heard of it and were afraid of it — they [believed it]. And I also started to later. When we left the village and reached 5,000 meters above sea level, that is the first time we slept in tents. Up until then we slept in houses. And there really was a certain energy to the place. It was empowering, because it gave you this feeling that there are things greater than you. The Himalayas made me realize how small we humans are. And everything that surrounds us is pretty massive. Everything I saw was millions of times greater than me and my strengths and flaws. It was spiritually calming and cleansing. You had the chance to self-reflect and see that everything is OK. Peaceful. There were many destroyed houses that came down from earthquakes [in 2015]. There were people that died at the time as well, and from that time, many villages don’t have electricity anymore. Especially the last few [as you ascend]. At the end of her trip, locals in Na village presented Uta with a scarf or ‘khata,’ which symbolizes purity and compassion and is traditionally presented to people when they have climbed a mountain in Nepal. Photo courtesy of Uta Ibrahimi. How did you decide to visit the Himalayas? Xhim (Begeja, a mountaineer from Albania) invited me… it is part of a project called Albanian Women in the Himalayas. He has been following women to see who is fit enough to make the trip. He was a mountaineer himself, so he knows the importance of developing mountain-climbing back home. He also knows how important it is to promote Albanian women around the world — I mean women from both Kosovo and Albania. I’ve told everyone I met there about our country. When I obtained my license, Kosovo was not a part of the list of countries compiled by the institution that issues licenses. You cannot climb in Nepal without obtaining a license from the state. You need to get the license and pay. 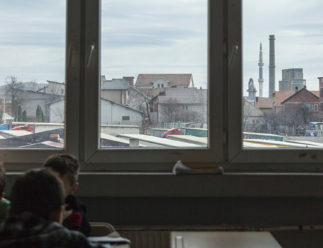 But Kosovo was not a part of their system. The project was not only about me, but about developing mountain-climbing in our region, and promoting the place of Albanians, and I don’t mean only Kosovo but Albania as well because this is a project that has been initiated and financed by them. If you have a dream, you can achieve it, you just have to work hard. The project is ongoing. There are a few peaks that we are looking to reach within the next 18 months. For me this project was a dream come true. People say that when you come together, you are stronger. For me this experience has shown once again that you can do things on your own as well. If you have a dream, you can achieve it, you just have to work hard. People must not be afraid. They should do what they have to, and they should make their voices heard. I, for example, by making my voice heard, and by being proud of myself and the things I do, have managed to do these things. I am not a part of some stupid group that believes that women should keep their mouths shut and be told what to do. Hiking has become a kind of a trend in our part of the world. Many people have tried it at least once. Some give up, some have the power and desire to keep going. What would your advice be to those that like it, that think of it as more than just a hobby? Many people think that going to the mountains is too physical, too difficult, and they think they can’t hike… they all think of it as a big deal. They all think that they don’t have enough time. But it has changed my life. I’ve always been athletic. But there was a time when I stopped doing sports, and started clubbing, which is also really nice. Then I started thinking about how if I go out to hike, to be in nature, to be at one with nature, I won’t spend my life in vain. When you are close to nature, you are close to yourself. Now everyone has a chance to go hiking once a week or once a month. There are many opportunities. Before it was more difficult. Now there are clubs that organize these things.